I cannot even begin to express how much I LOVED this Weight Watchers Crock Pot Recipe. The chicken is so incredibly flavorful and moist, and there is a lot of sauce so you can really smother it (I’m a big sauce person). For some extra Points, serve it over rice, noodles or quinoa. To avoid adding any extra points, I like eating this over roasted zucchini, red onion and pineapple. Any way you decide to eat it, this Crock Pot Sweet and Sour Garlic Chicken Recipe is incredibly delicious, and is sure to be a hit with the whole family. This fix it and forget it slow cooker meal brings a lovely and delicious meal to your table with just minutes of prep work. Gotta love that. This one is a must try, folks. Sweet, tangy, and garlicky, tis ridiculously easy crock pot chicken recipe packs an amazing punch of flavor, for just a handful of Points. 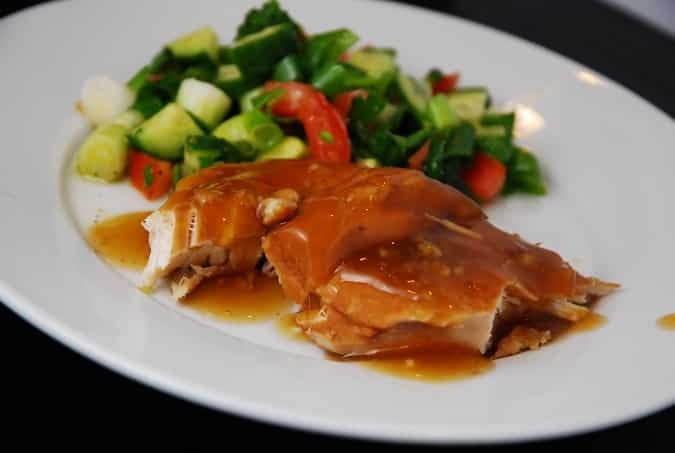 It’s a no fuss meal that delivers moist and juicy chicken with a delicious sweet and sour sauce. Salt and pepper chicken breasts and place in slow cooker. In a medium sized bowl, whisk together remaining ingredients (all EXCEPT the cornstarch), and pour over chicken. Remove chicken from slow cooker and pour all the leftover sauce into a medium sized sauce pan, and set over medium high heat. In a very small bowl, mix together the cornstarch with two tablespoons of water. Then, add that into the sauce. Bring to a simmer, and stir continuously until sauce begins to thicken, about 3 minutes. Remove from heat and let sit for about 1-2 more minutes as the sauce will thicken more as it cools. Absolutely delicious as written. The sauce was a little thick, so I added a little water to thin it at the end. Thank you for introducing me to such wonderful recipes. You are the best! I would suggest lemon lime seltzer. You only use a 1/4 c so and a 1/2 of brown sugar so I think the sweetness would still be fine. What would you suggest as a substitute for the soda?